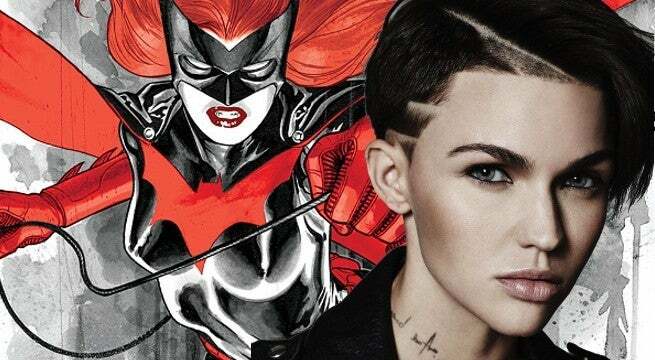 Ruby Rose has been tapped to play Kate Kane/Batwoman, the first openly lesbian superhero on television, for The CW's Batwoman. Her character will debut in the upcoming Arrowverse crossover event on the network in December. Rose's casting comes after recent reports indicated that the network had made a priority of casting an openly gay actress to play Batwoman. Rose, who is herself openly gay, may be best known to audiences for her role on Netflix's Orange Is the New Black. She has also appeared in Pitch Perfect 3, John Wick: Chapter 2, and will next appear in The Meg. With Rose's casting, The CW further cements its reputation for diverse characters and actors. The network recently cast transgender actress Nicole Maines to play the first live-action trans superhero on the network's Supergirl next season. In comics, Batwoman is the first major DC superhero to be openly gay. First introduced in 1956, Batwoman largely disappeared from continuity until 2006, when she was reintroduced. An openly gay Jewish woman, Batwoman has a military background and has proven herself every bit Batman's equal on the pages of comic books. She's even served as the primary featured hero for Gotham City in Detective Comics while Batman wasnt in the picture. In The CW series, which the network said is in the early stages of development, the character appears to be leaning heavily into that comic book representation. In a casting description for Batwoman, Kate Kane is described as proudly openly gay and having once aspired to have a successful military career, dreams that were snuffed when she was kicked out of West Point for coming out. As in comics, television's Batwoman will also have to face many of her own personal demons even as she suits up as Gotham's symbol of hope and justice. Rose's casting comes on the heels of Monday's statement by network president Mark Pedowitz that the network anticipates a pilot for the Batwoman series as early as midseason. "We'll do a pilot for midseason, whether it goes to series, I cannot tell you," Pedowitz said at the TCA summer press tour. "We have five [DC shows] on the air and just added a sixth night." Caroline Dries, who served as a writer and producer on The Vampire Diaries, is set to be the executive producer on Batwoman. Joining Dries in the EP role are Greg Berlanti, Sarah Schechter, and Geoff Johns, the latter of which recently stepped down as the head of DC Entertainment. Berlanti and Schechter will produce via Berlanti Productions in association with Warner Bros. Television. If picked up, the series would air in the 2019 TV season. Fans will get their first look at Rose as Batwoman in the big Arrowverse crossover event this December on The CW. What do you think about Ruby Rose's casting? Let us know in the comments below!